Imagery is an attempt to make image search better. 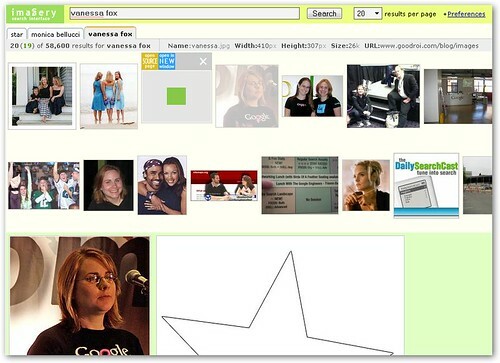 Imagery processes search results from Google Images to make finding images faster and more intuitive. The chief way it does this is by reducing the amount of text on the page in favor of visual representations of data. In the place of image dimensions, Imagery shows you how large an image is relative to the size of your screen. A green box means the image is smaller than your screen, and a red box means it's bigger. You can either mouse-over an image to see the comparison for that particular image or click on the white space between the images to see the relative sizes for all the images. To see the original image, click on its thumbnail to open it instantly on the same page. There's also a handy tabbed browsing interface to keep track of your past searches. A complete list of clever shortcuts and well thought out touches can be found here. Overall, Imagery manages the feat of transforming Google Image search from a somewhat clunky and awkward tool to a slick and fluid visual way of conducting image searches.